On Saturday, February 6th, your Fort Wayne Derby Girls Bomb Squad, currently ranked 76th in the world, will be taking on the 144th-ranked Hammer City Roller Girls of Hamilton, Ontario. Come cheer on the derby girls to their first win of the season! Show up early and stay late for even more exciting derby action! VALENTINES SPECIAL: 2 tickets for $20! Individual tickets are $12 each, and are good for all three games! 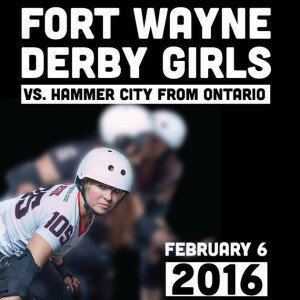 See your local derby girl or visit the Coliseum box office to get your tickets. Group rates are available.